One of D's favourite shows on TV has always been Curious George. When he was around one he would watch only Disney Junior and as soon as Curious George came on he lit up. Nothing could distract him from watching George and The man in the yellow hat. After a while I went in search of any toys that where of Curious George, after a few weeks I gave up as there didn't seem to be any. In the end we settled for getting D a monkey from Build-A-Bear which we named Curious George. It has always been D's favourite. 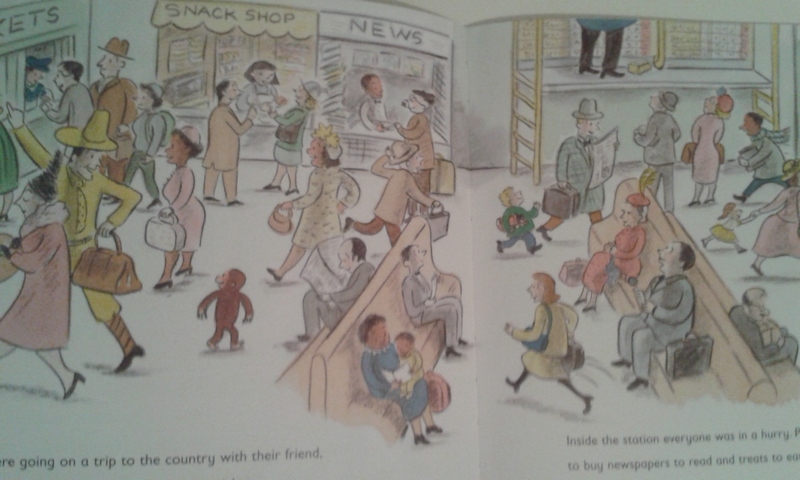 Last month while we where out I came across a range of Curious George books and I knew that D would love one! 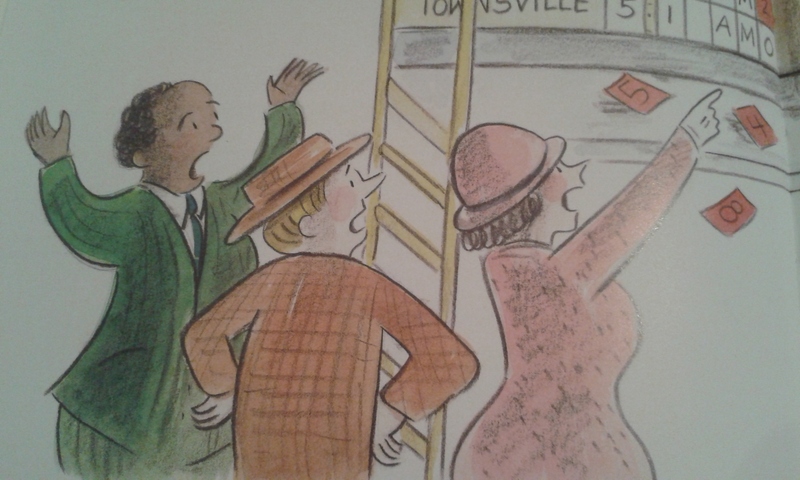 I stood looking at all the titles a few times and in the end I chose Curious George Catches a Train by Margret & H. A. Rey's. We had seen most of the other episodes on TV and I don't remember seeing this one. mischief and has to escape from some angry people. He escapes towards a waiting train at the station which people are walking towards. On his way there a little boy also follows the people and is running towards the tracks behind George. I'll leave it there and you can find out what else happens on you own. This book isn't perfect for learning to read with but D is getting pretty good at reading using only the pictures in a book. He knew what was happening in his own words before we even started! Each page of the book contains between 3 and 7 sentences which very in length. There is also a broad range of words inside the story which is a good point for D and his reading journey. He knew some of the simple words which he had seen before and was able to tell me them when he was asked. We went through the book more than once in each reading session and D has been recognising more words each time we read the book. The book itself has bright, colourful pictures which clearly depict the story written in the book. I love that the pictures look drawn by hand.You can see the pencil marks, the shading you can see that so much time went into creating them with a good old pencil to paper! It creates the feel of a story that really happened and someone is recording those events. Through the picture's D was able to tell me when people where happy, sad, or angry as well as what was in the background of each picture. He found many items that weren't mentioned in the story itself but still appear in the picture's. The story itself was filled with action and adventure. It practically leaped off the pages, especially to D. He was entranced with the story and really enjoyed listening to me read it. There was so much happening in the story and the pictures. So many little details to find and some great talking points. D has only ever took a few trains and most where when he was a small baby and I went out with my sisters or family. Going to a train station and seeing everything there is to see is such an exciting adventure to D and one we plan on doing this summer. Reading about Curious George catching a train was both of D's favourite things colliding inside another favourite of his, books! If there was ever a book that was perfectly made for D this would be it! 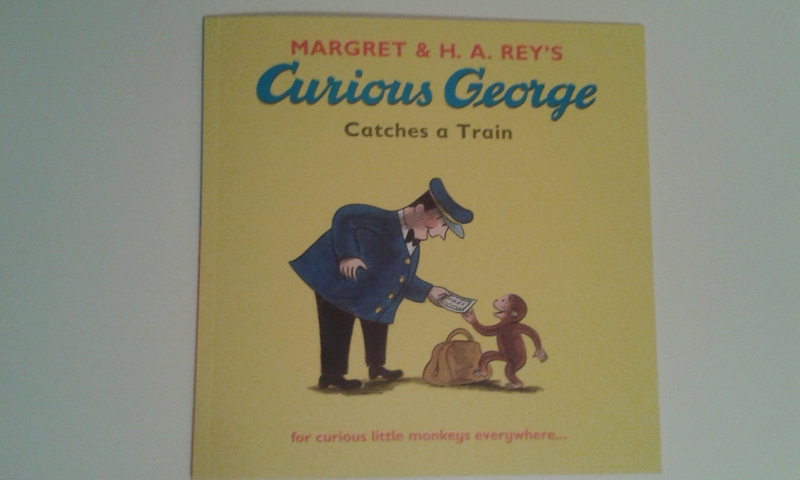 Curious George Catches a train by Margret and H. A. Rey's is a great book that even I enjoyed reading (over and over again). The story is engaging for young children and toddlers with lovely pictures. I would recommend this one for any Curious George lover out there! It is a great book and series of which I plan on getting many more of the books. You can purchase Curious George Catches a Train on Amazon by clicking on the link, the book costs £3.99 at the time of writing this post. If you would like the chance to win another book from the series, Curious George Visits the Library head over to our Facebook page Us Two Plus You and enter for you chance to win one! 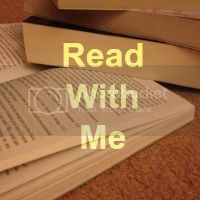 If you need some more inspiration for books to read you can check out all our What We're Reading posts by clicking on the badge below. Thank you. It's so hard to find anything at all! Every other programme has toys but Curious George has been out for years and hasn't got one. My daughter loves Curious George. I think her favourite story is Curious George Goes to the Beach. He's very loveable isn't he? Haha! We love Curious George. 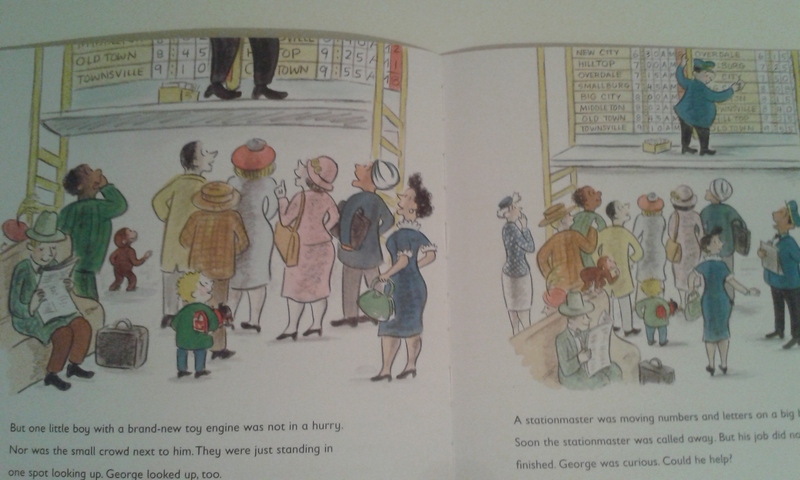 We were recently bought one of the Curious George books and I think my 3 year old would like this one too. 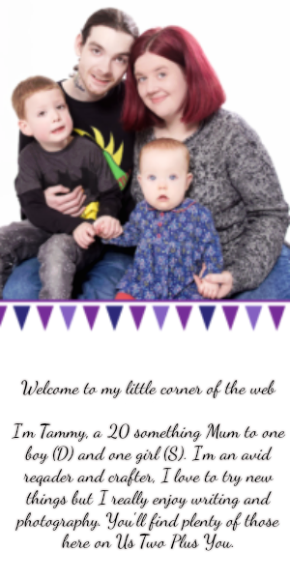 Lovely to read about your little one engaged and interacted with the illustrations and the story. I'm sure your 3 year old would enjoy this one. D loves this one, we've read it so many times I can almost recite it! Haha.